This sensor allows you to keep track of temperature and humidity. Suitable for monitoring, for example, the guest house or the food storage. The signals can be picked up by a TellStick so you can let the sensor control other devices in your smart home. The cable to the probe is approximately 85 cm long. You can keep track of the values in your smartphone using the Telldus app. 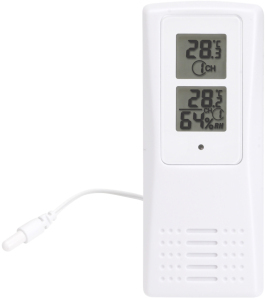 The sensor is also equipped with dual displays so that you can read all measurement values directly.